Thank you for considering the submission of your work to the Journal for possible publication. We welcome papers which may be Original Research, Clinical Review, Case Reports, Letters or Notes. All articles must be submitted in English. Spelling should be in accord with the Shorter Oxford Dictionary. To be kept as brief, clear and unambiguous as possible. The summary shall consist of not more than 200 words. This applies to both research and review articles. For research articles, the summary should be structured under the following headings: introduction, aims and objectives, design, methods, results and conclusions. FIRSTLY a single file including all Figures and Tables and their accompanying Legends. Articles should be clear and concise. Text should be typed in Times New Roman font, size 11 ; double-spaced with a 3 cm margin on sides, top and bottom. Each page must be clearly numbered. Tables and Figures should clearly identified, using Arabic numerals i.e., Table 1; Figure 2 etc. The first page of the manuscript should list the title of the article, the author’s(s’) name(s), qualification(s), affiliations, telephone and fax numbers and address(es), including e-mail address(es) if available. It is especially important that details of the Corresponding Author should be clearly stated. In the case of multiple authors, the role played and the respective contribution made by each should be recorded. For example “principal researcher 60%; writing article 35%; advisor10% etc. Authors are requested to note and adhere to the style of the Journal particularly with respect to paragraph settings and headings. In general, papers should be between 4000 and 5000 words, although this is flexible. The Editor reserves the right to edit the length of an article in conjunction with the author(s) and SADJ reserves the right to charge for excess/additional pages. The first four pages of original research papers published in the SADJ will be free of charge after which a charge of R500 per page or part thereof will be levied. Illustrations/graphics/photographs must be appropriate to the content of the manuscript. Digital images with a DPI of at least 300 should be supplied. Photocopies and pdf files of photographs are not acceptable. Please note the request that Figures be included in the text AND in a separate file. Thank you. The Figure number must be in Arabic style and clearly identified for each illustration, graphic or photograph. Remember also to record Figure numbers in the text. Permission. Where any text, tables or illustrations are used from previously published work, permission must first be obtained from the holder of copyright and a copy of the agreement must be submitted with the article. Suitable acknowledgement must be recorded in the article. References should be set out in the Vancouver style and only approved abbreviations of journal titles should be used (consult the List of Journals Indexed in Index Medicus for these details at: http://www.nlm.nih.gov/tsd/serials/lji.html). References should be inserted seriatim in the text using superscript numbers and should be listed at the end of the article in numerical order. Do not list them alphabetically. It is the author’s responsibility to verify each reference from its original source. Please note that an article may be rejected if the referencing is inaccurate. Names and initials of all authors should be given unless there are more than six, in which case the first three names should be given followed by ‘et al.’. First and last page numbers should be given. Where it is applicable the page numbers should be abbreviated by omitting redundant numbers e.g., pages 456 to 478 is recorded as 456-78, and 456 to 459 as 456-9, but 398 to 401 is recorded as 398-401. Notice that volume numbers are not given in bold, authors are not linked by ‘and’ or ‘&’, and the date of publication appears after the name of the journal. No item should appear in italics except for foreign terms, e.g., et al., in vivo. Journal references should appear thus: Smith NC, Haines A. The role of the dentist in public health promotion. Br Dent J 1983; 298: 249-51. Terblanche N. Principles of Periodontology, 4th ed. London: Butterworth, 1985: 96-101. Weinstein L, Swartz MN. Pathogenic properties of invading microorganisms. In: Sodeman WA, Smith RT, eds. Pathologic Physiology: Mechanisms of Disease. Philadelphia: WB Saunders, 1974: 457-72. ‘Unpublished observations’ and ‘personal communications’ may be cited in the text but not in the reference list. Manuscripts accepted but not yet published may be included as references followed by the words ‘in press’. Please supply 5-8 questions related to your article, at least three of which should be in the multiple choice format. Answers must be either True or False or if multiple choice, have only one correct answer. Please provide answers to the questions by highlighting the correct response. as a record of communication regarding the patient and other health care providers. to protect the legal interests of all parties involved. for billing, quality assurance, and other administrative functions. Changes/corrections to the proofs supplied to authors must be submitted to the publishers by email or by fax and not over the telephone. Galley proofs must please be returned to the publishers within four days after receipt thereof. All sources of funding, possible financial interest/s or incentives in products or services mentioned in the article must be disclosed. Authors are kindly requested to read and sign the attached declaration. No articles that have been published previously, or that are currently being considered for publication elsewhere, will be accepted. Authors are kindly requested to verify that their article complies with this condition. Where relevant, authors should indicate whether their research has been approved by the Ethics Committee of their Institution or by other research ethics committees. Authors must disclose their involvement with any company either owned by them or from which they have received a grant or remuneration and must declare any other personal interest they may have which would constitute a conflict of interest. 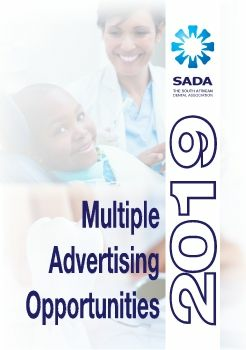 All articles submitted to the journal and accepted for publication automatically become the copyright property of the South African Dental Journal [SADJ]. The Managing Editor reserves the right to decline articles, photographs or illustrations where products or services are mentioned that are not appropriate. The Corresponding Author is kindly requested to identify himself/herself (on the title page) and to supply his/her postal address, telephone numbers (home, office, cell), fax number and e-mail address. All authors are to supply details of qualifications and position(s) currently held. Authors under 35 years: Please consider identifying any first author who is under the age of 35 as the Association makes an annual award (Young Essayist Award) to the best paper published by a young researcher.